What Are The Safest Hospitals in America? Every month, according to the U.S. Department of Health and Human Services, 6,000 serious medical errors occur among Medicare patients alone. These include leaving surgical instruments inside patients, administering the wrong medication, infections and more. As the result of publicity surrounding the disastrous results of hospital errors, and information collected from sources such as the Centers for Medicare and Medicaid Services, the American Hospital Association and the Leapfrog Hospital Survey, more hospitals are stepping up to the plate to improve hospital safety. Some of the safety measures include barcodes to match the right medicine to the correct patient, ultraviolet lights that kill germs, and integrated electronic medical record keeping so new prescriptions can be checked against the patient's medical record before administering. 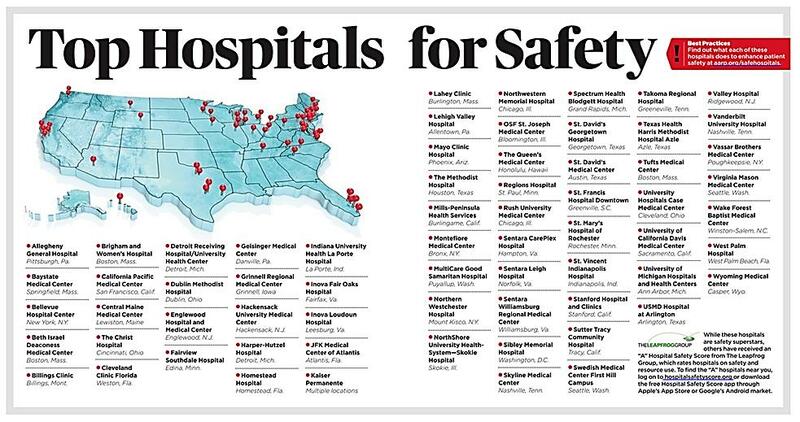 As a result, data collected from the above sources have identified some of the top safest hospitals in the country.